I’m actually writing this from the morning of day 7. We had to meet at 5am for our train ride to Berlin, so I went to bed fairly early last night. We didn’t arrive in Aahrus, Denmark until 1pm yesterday, so I was able to get in a 3-mile run on the dreadmill and then enjoy a leisurely breakfast with my dad in the Horizon Court. 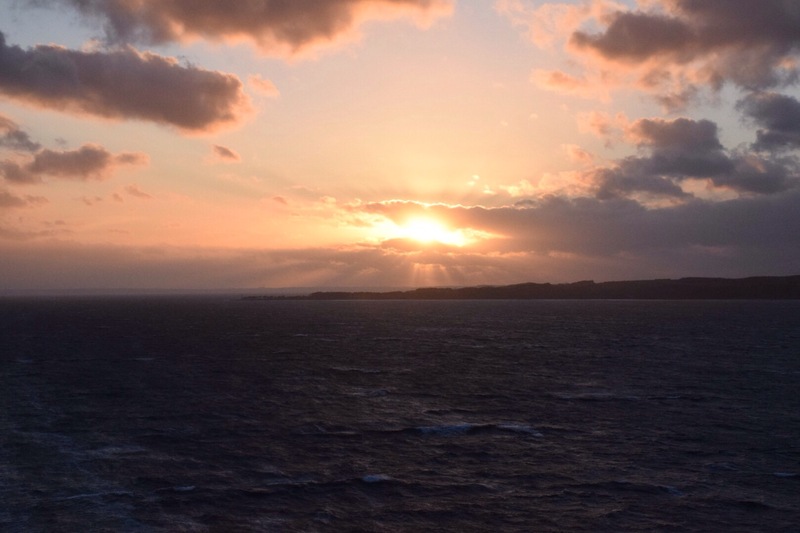 I didn’t run on deck because we woke to heavy rain, 50° temps, and “gale force winds” (captain’s words). Our boat docked in the “container port” at Aarhus, because the ship is too large to use the regular port. Due to the strong winds, the ship was assisted by two tugs on its way to the dock. 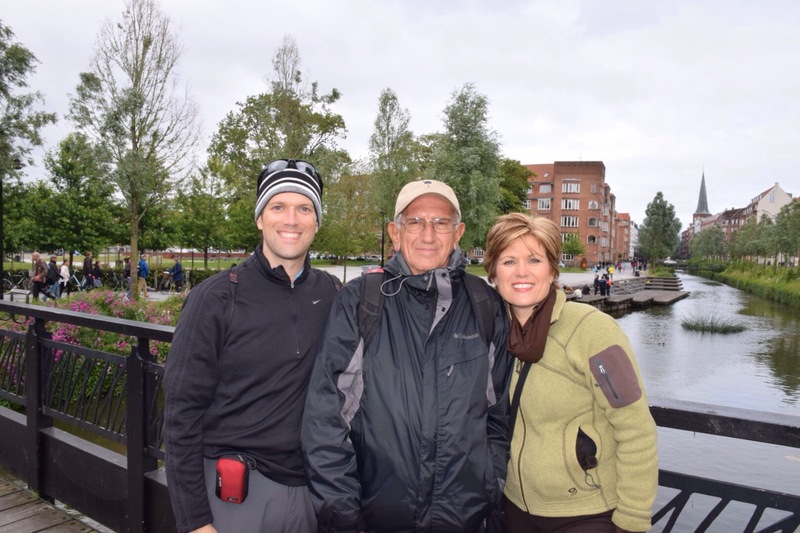 Daddy, Patsy, Ben, and I boarded our tour bus at the dock, with our guide Lena, and headed toward Aahrus Cathedral. On the way we learned that Aahrus is one of the oldest towns in Denmark. It was founded by Vikings in 700 AD, and they began building a fortress in 770. The Vikings named the town Aahrus, which means “where the river flows slowly into the sea.” This seems quite appropriate since there is a river running right through the middle of the city that flows into the sea. Today, 330,000 people live in Aahrus. Taxation is extremely high in Denmark, but healthcare and education (through university) are free to residents. Aahrus University currently has 40,000 students. 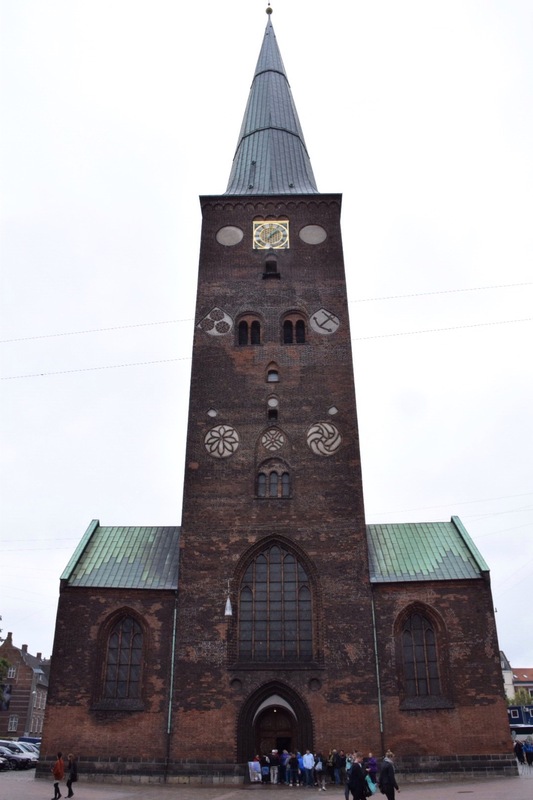 The Aahrus Cathedral is the tallest and longest in Denmark, and can be seen from just about anywhere in the city (even from the ship). It was originally built in 1190 AD, and I was stunned at the sheer size of the structure. 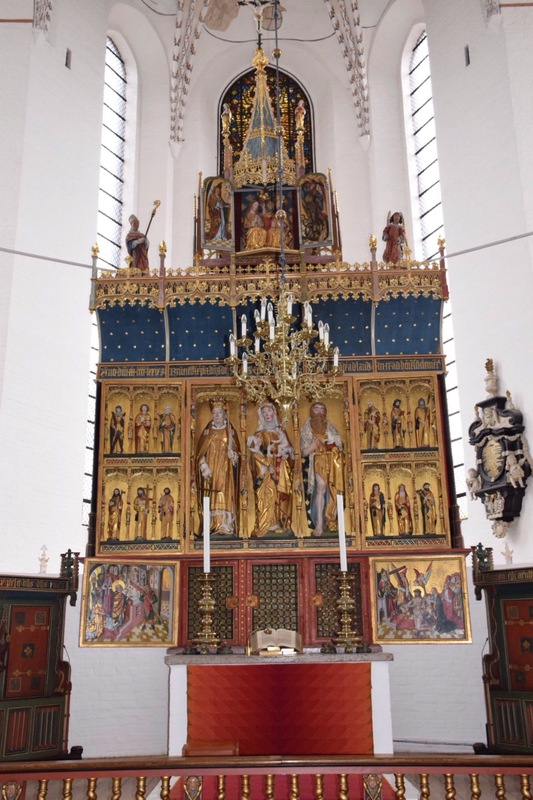 The Aahrus Cathedral has connection to Oslo, Norway in that the sculptor Vigelands’s brother made the back window behind the altar. The inside of the cathedral was stunning, and it was awesome to see all the various elements that were added through the centuries. We saw several fresco paintings that were over 600 years old. One in particular was divided into three sections from top to bottom. 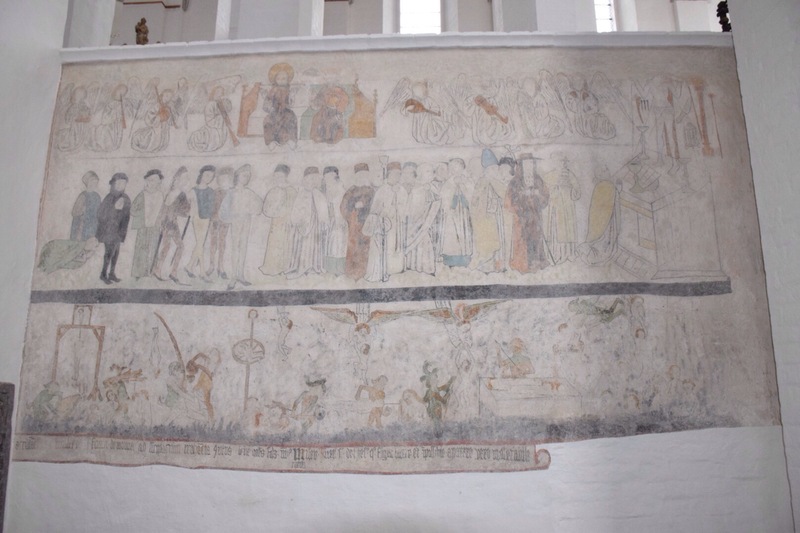 The middle section showed worshippers lined up at an altar and Christ hanging on the cross above the altar with his blood pouring into the Holy Grail. The bottom section was a scene from purgatory, and the top a scene from paradise. The guide said this was a warning to church members that if they lived the wrong way they would end up in the bottom scene. 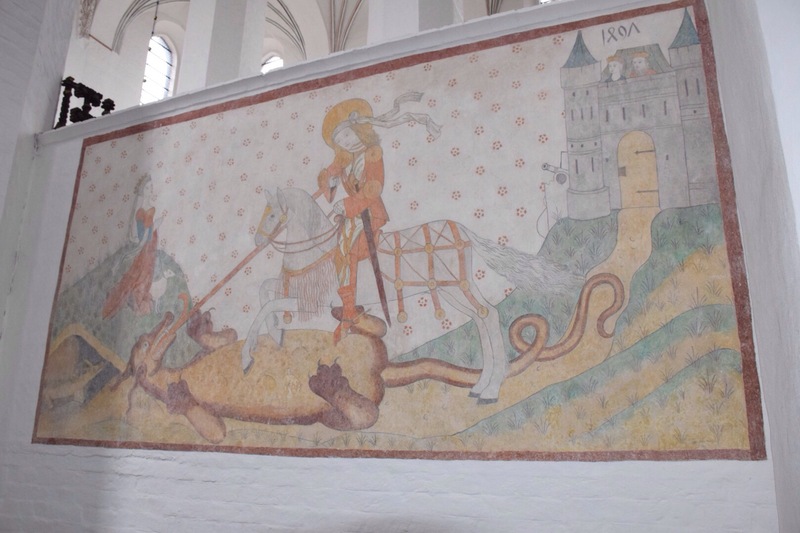 Another interesting fresco showed St. George slaying a dragon. 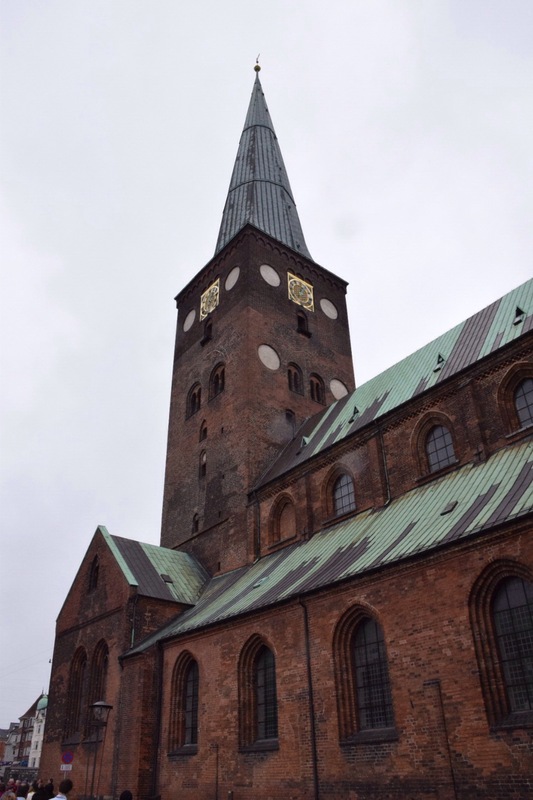 The cathedral was Catholic until 1536, when it was changed to Lutheran by the king of Denmark. 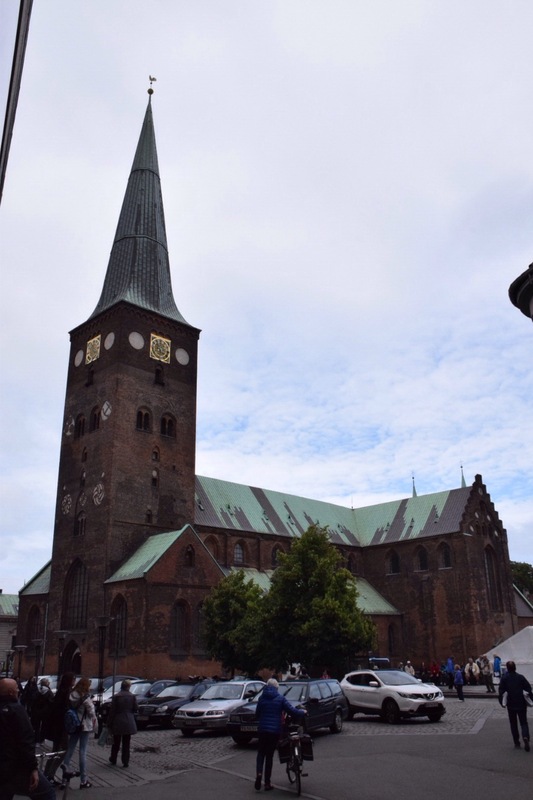 Today, 79% of the citizens of Denmark are Lutheran. The altar was constructed in 1479 and is clearly catholic. It depicts Jesus, Mary, the 12 apostles, and St. Clemens, the patron saint of the cathedral, among others. Even though it is catholic, it was kept because of its beauty. 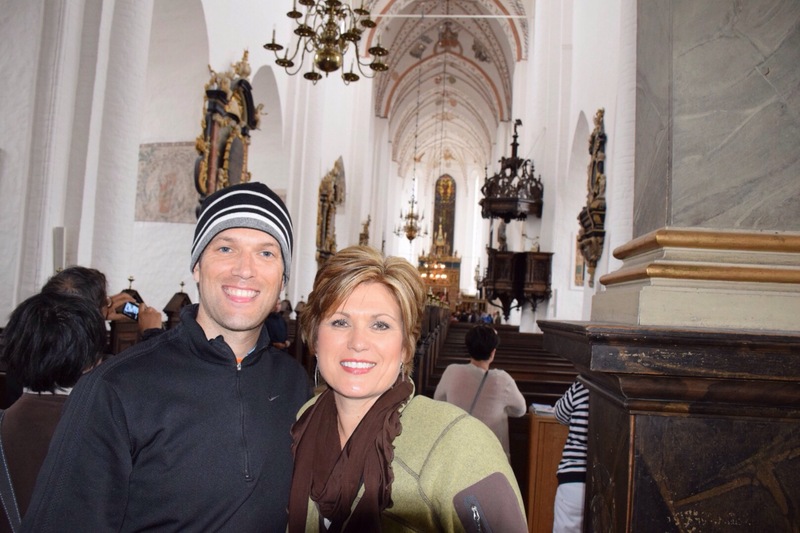 We learned that most churches in Denmark have ships inside due to the country’s reliance on the sea. 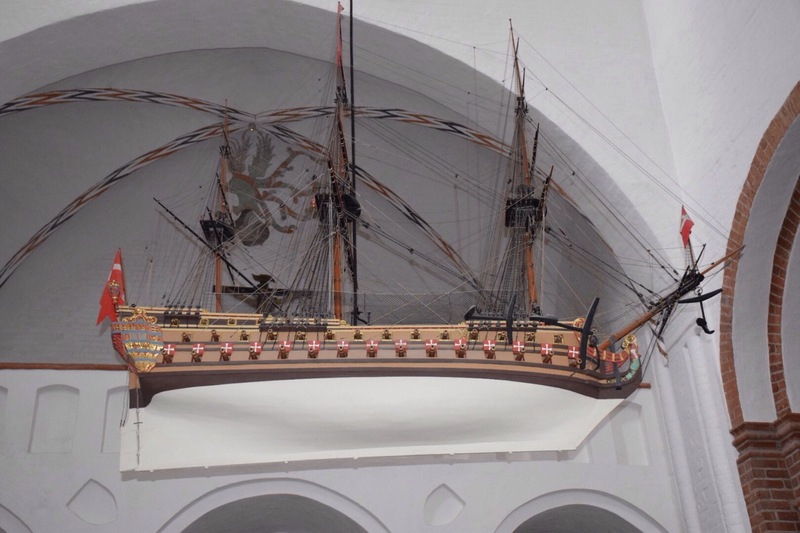 Also, in Denmark they actually call the aisle in churches “skieet,” which is the Danish word for ship. We saw a cool battleship hanging from the ceiling in the Aahrus Carhedral. 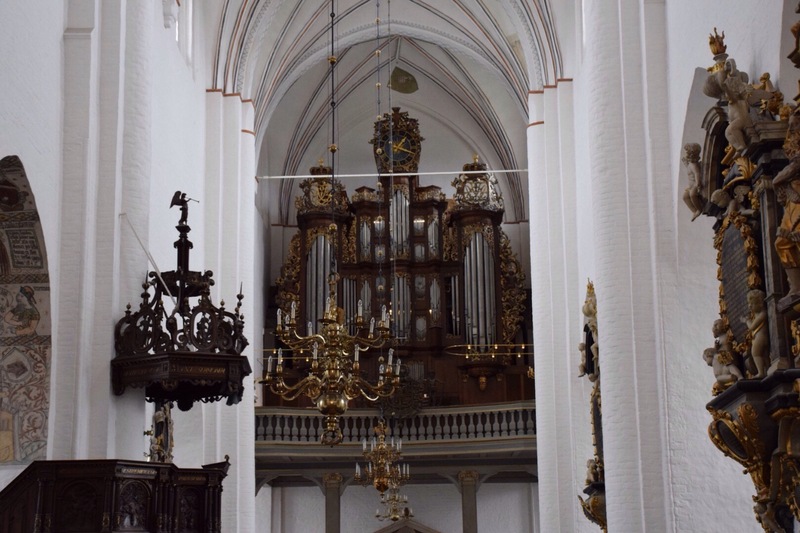 The organ in the cathedral is from the 1700s, and it is so large, and the cathedral so long, that it takes 7 seconds for sound to make it through to the back from the time a key is pressed. It is largest organ in Denmark. 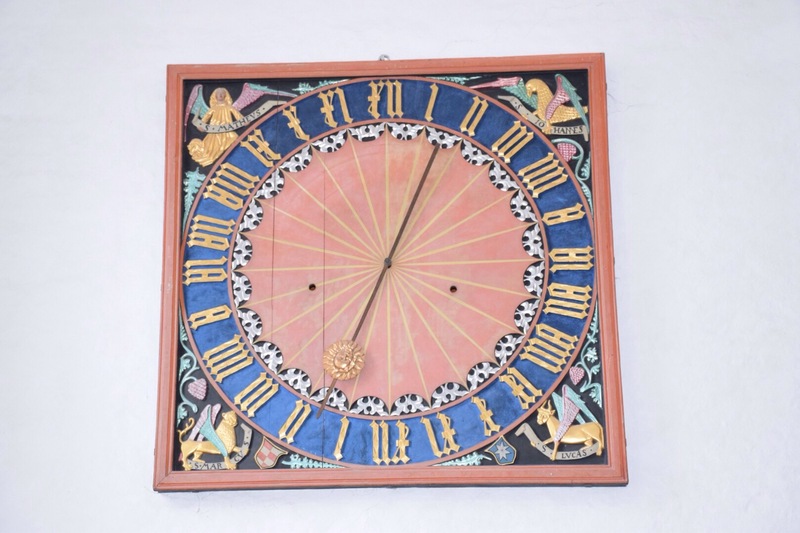 I could write about so many things in the cathedral, but the last I’ll mention is the 24-hour clock mounted near the entrance. Not only was it beautiful, but this also makes a lot of sense. 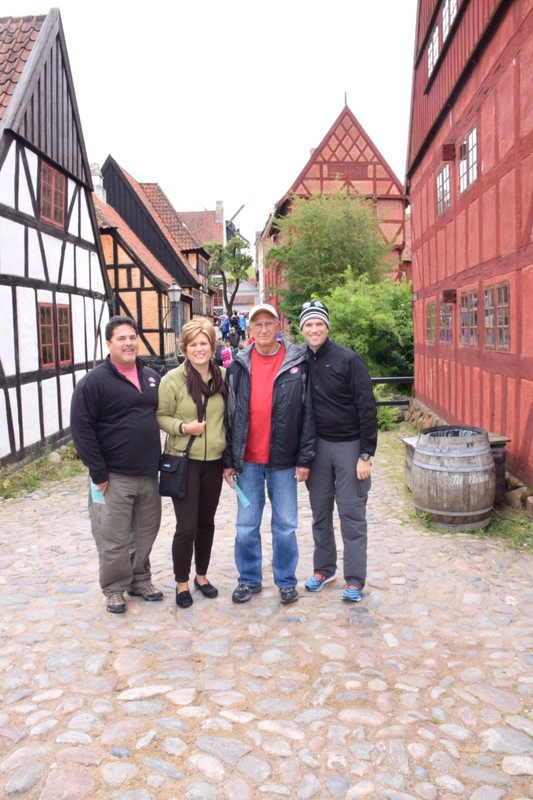 From the cathedral we took the motor coach through the city to the open air museum called Den Gamle By. This is a collection of houses and buildings from all over Denmark and configured into a village. It very much reminded me of colonial Williamsburg in the states. This structures ranged in ages from the 1500s to the early 1900s. By far my favorite was the Mintmaster’s Mansion. 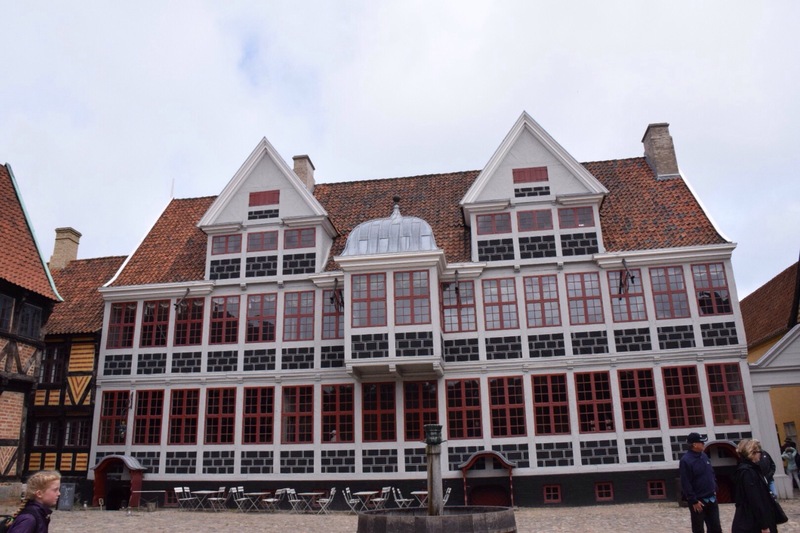 It was built in the 1600s and remodeled several times through the 1800s before being deconstructed and rebuilt in Den Gamle By. It was very unusual looking on the outside, but the decor on the inside was downright crazy, though very interesting. 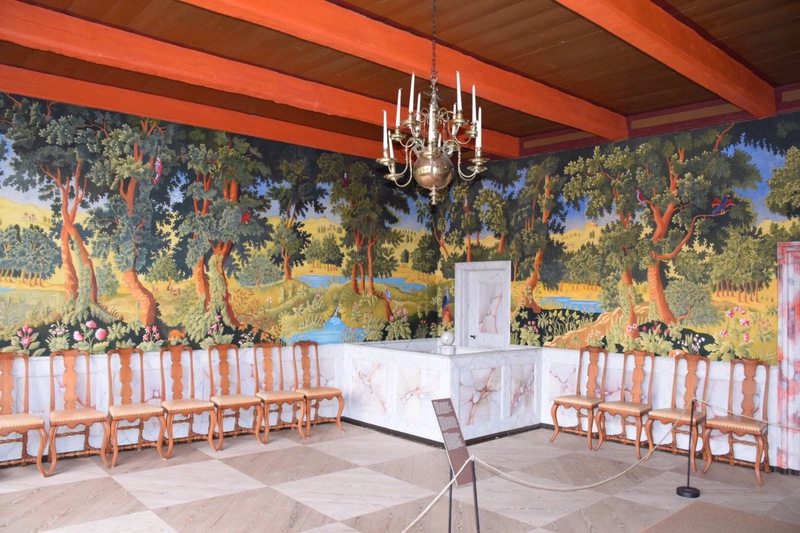 Most of the rooms had hand painted designs on the walls, ceilings, and even the doors. After leaving the museum, we headed to the city center for a couple of hours of shopping and walking around the city. The most interesting thing we saw was the art museum with its “Rainbow Walk” on the very top. 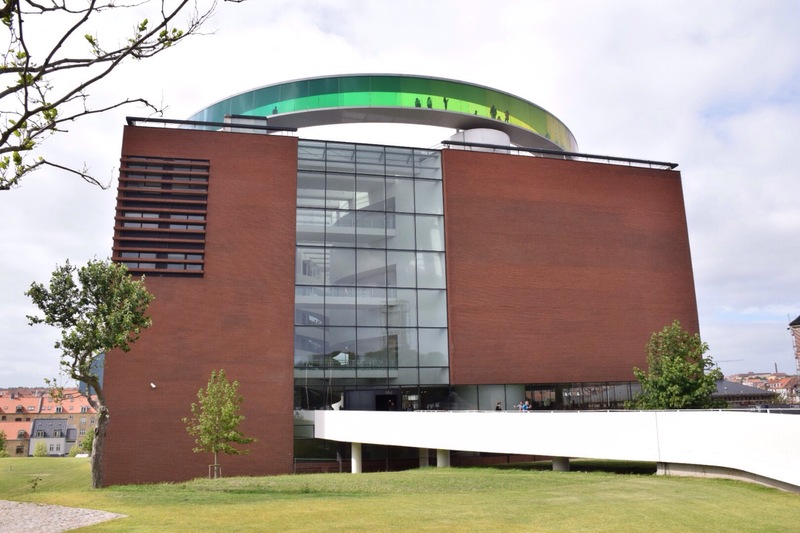 It is essentially a circular glass tube you can walk through and the glass includes all the colors of the rainbow. I wish we had time to go into the museum, but we were only able to see it from the outside. We headed back to the ship around 5:30pm, and after talking to my girls on the phone for a few minutes, we sat down for a nice dinner in the Concerto dining room. I had some sushi, followed by garlic soup and roast beef. After dinner there was a nice show on “Soul Music” in the theater, and then I closed out the day by enjoying a beautiful sunset on deck as we sailed away from Aahrus.